The vertical distribution of planktonic rotifers has been analysed in relation to season in several meromictic lakes; a coastal lagoon with sea-water intrusion and three dissolution lakes from two karstic systems. Two species, Filinia hofmanni and a form of Anuraeopsis fissa have been found to be more or less restricted to the chemocline or adjacent strata any time they occurred. Many species common in the upper water layers developed large populations near or in the chemocline and more strikingly in summer. Some species had two vertical maxima (one in the surface or the thermocline and another near the chemocline), while others successively shifted their maxima between the upper layers and the chemocline. 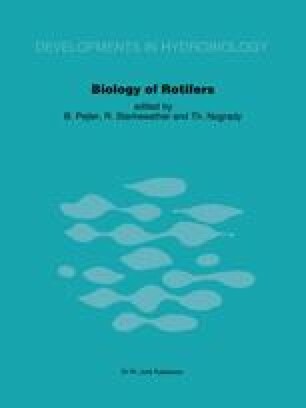 It is hypothetized that these rotifers are either very versatile or are differentiated as ecotypes, one of them adapted to the chemocline environment. This distribution in a peculiar fluctuating, anoxic, H2S-rich environment poses questions about the biology of those rotifers which there develop extraordinary populations.